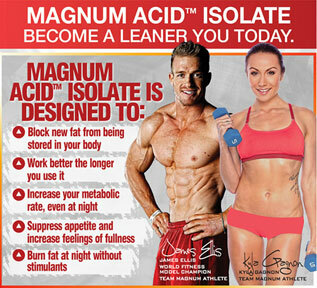 MAGNUM ACID™ ISOLATE is a scientifically-validated, non-stimulant fat burner that will help you reach your fat loss goals quicker, more easily and with no cycling off necessary - it actually works better over time. 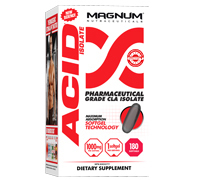 MAGNUM ACID™ ISOLATE is a powerful blend of the two most metabolically effective CLA isomers in the world: cis-9, trans-11 and trans-10, cis-12. Decrease the activity of fat-storing enzymes. 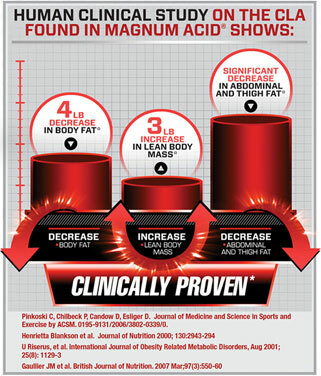 Magnum Acid™ helps block excess energy from entering fat cells, preventing them from maturing and increasing in size. Increase caloric expenditure when used regularly. Research shows these two isomers have the ability to increase norepinephrine, which is one of the body's most powerful fat-burning hormones. Reduces hunger cravings and increases feelings of fullness. This can help you stay on track with your diet to ensure your weight loss results. To achieve a Pharmaceutical Grade standard, a product must be more than 99% pure with no binders, fillers, excipients, dyes or unknown substances. Pharmaceutical Grade is the highest standard in the supplement industry. Meeting this standard costs far more, but the resulting product is truely superior. Magnum uses only Pharmaceutical Grade ingredients, a key reason why our products are so effective. 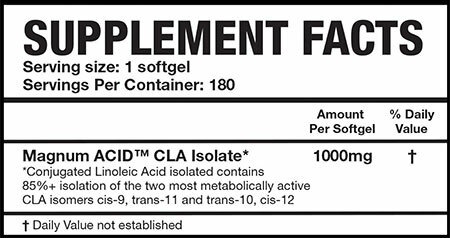 Recommended Dose: Take 2 softgels three times daily on an empty stomach, preferably 5 minutes before each meal.